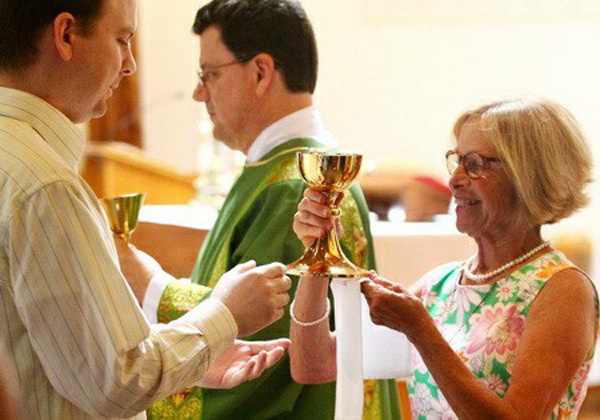 Women Eucharistic ministers increase in the U.S.
Novus Ordo churches every day emptier, priestly vocations every day fewer, women Eucharistic ministers every day more frequent. These three sad consequences are necessary results of the “new springtime” of Vatican II. Were they planned? We believe so. If we add to this equation the closing of churches, the merging / shrinking of parishes and the ever-growing immersion of the Church into social and ecological issues, it is not hard to envisage that the architects of the Conciliar Revolution wanted to completely destroy the characteristics of what was once the One, Holy, Catholic, Apostolic and Roman Church. The remains will be led by homosexual priests and women deacons... until they finally sink and disappear in the mud. We are not making this up. Joseph Ratzinger and Yves Congar said it clearly a long time ago. You can read it here. How Long Will it Take to Ordain Woman Priests?